John Bruce, President and Chief Operating Officer, has been selected to present an education session at The HR Southwest Conference in Fort Worth, Texas this fall. The event, which draws approximately 1,700 HR professionals annually, will be held at the Fort Worth Convention Center October 17 - 19, 2016. In his session, "Emotional Intelligence - A Practical Application," John will discuss emotional intelligence and its implications within the workplace. 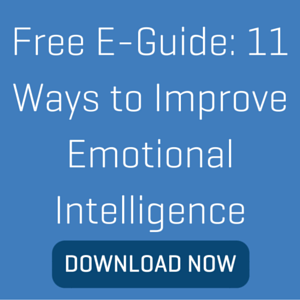 Emotional Intelligence (EQ) has been the subject of many books and articles written over the past few decades and there are strong correlations between EQ level, leadership success, and compensation level. What’s exciting is that EQ (unlike IQ) can be increased with the right focus and practice. Therefore it has become a critical component of most leadership programs including the leadership development approach used by Performex. Each participant will receive an EQ assessment they can take after the presentation to learn their own EQ and how to improve it. The desired outcome is for all attendees to take away information they can apply the next day! Click here for full conference details and registration. 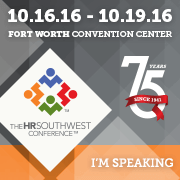 Will you be attending HR Southwest? Mark your calendar for John's speech on Wednesday, October 19th at 9:30AM in Room 203B. Also, please stop by Booth 922 to meet the Performex team and register to win a FitBit Alta!